This photograph of Kiki de Montparnasse's head next to an African ceremonial mask bears a title that references both the black and white process of photography as well as skin color. It was created at a time when African art and culture was much in vogue. The oval faces of the two almost look identical in their serene expressions, but he contrasts her soft pale face with the shiny black mask. He simplifies the conflict of society into a problem of lighting and imagery in aesthetics - one oval next to another oval; one laying on its side contrasted with another that is erect; one lit from above and the other from the side. 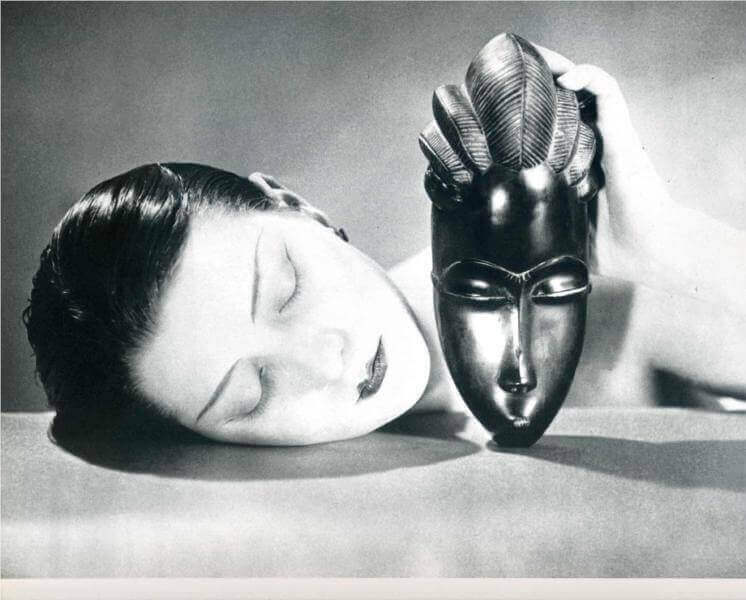 This picture is found in every catalogue, every exhibition of Man Ray's work. In addition to La Priere, Vioion d'lngres, Les Larmes, and a series of more-or-less experimental portraits of Ray's Paris artist friends, the image is among his best-known photographs. The picture was already included in the catalogue of 1934, Man Ray's first programmatic summary in book form. The artist himself accounted the originally square photograph, cropped into various formats, as one of the core works of his photographic production of the 1920s and early 1930s - an evaluation still shared today by exhibition organizers, writers, as well as art dealers and gallery owners.